It's Hip 2 Serve! : Military Appreciation Days at Old Navy!! 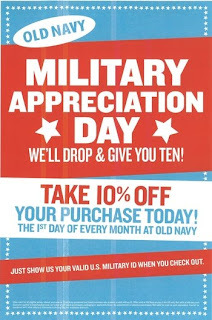 Old Navy is now offering a 10% military discount in their stores (not online) on the first day of each month! This discount is valid for all eligible active, retired, and reserve US Military personnel and family members who present a valid Military ID. Mark your calendar for June 1st (I'll post a reminder as well)!